into your pye with a litle claret wine being mixed with the gravy of mutton or beafe and bake them in a soaking oven. To make a tounge pye. 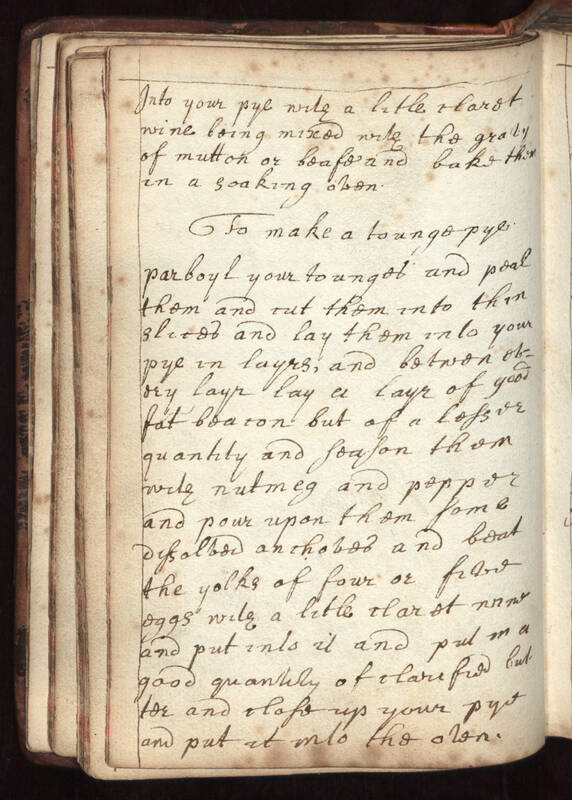 parboyl your tounges and peal them and cut them into thin slices and lay them into your pye in layrs, and betwen every layr lay a layr of good fat beacon but of a lesser quantity and season them with nutmeg and pepper and pour upon them some dissolved anchoves and beat the yolks of four or five eggs with a litle claret wine and put into it and put in a good quantity of clarified butter and close up your pye and put it into the oven.